The GAZ-66 is a Russian 4x4 all-road (off road) military truck produced by GAZ. It was the main transport vehicle for motorized infantry of the Soviet Army and is still employed in former Soviet Union countries. It is nicknamed shishiga (шишига) shehsherik (шешерик). The GAZ-66 has gained legendary status in many countries around the world due to its reliability, simplicity and off-road capability. Thanks to standard features such as a front mounted winch, Central Tire Inflation System (CTIS) and self locking differentials the GAZ-66 is extremely popular with armed forces all around the world as well as off-road enthusiasts. Production ceased in 1999, with the GAZ-3308 being produced instead. 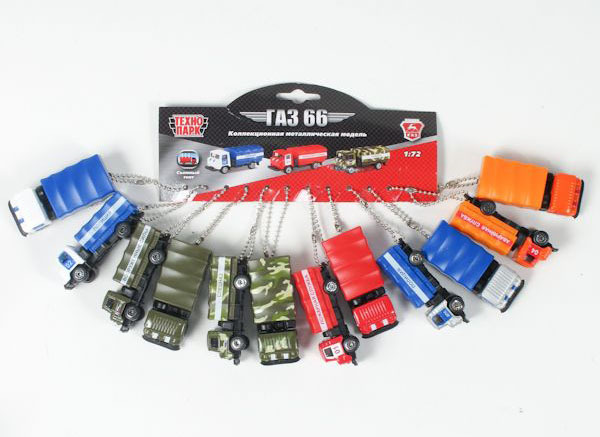 Model - toy - keychain. Metal and plastic. The model basically corresponds to the scale. Of course, further work was needed for that would bring it up to full compliance with the prototype. 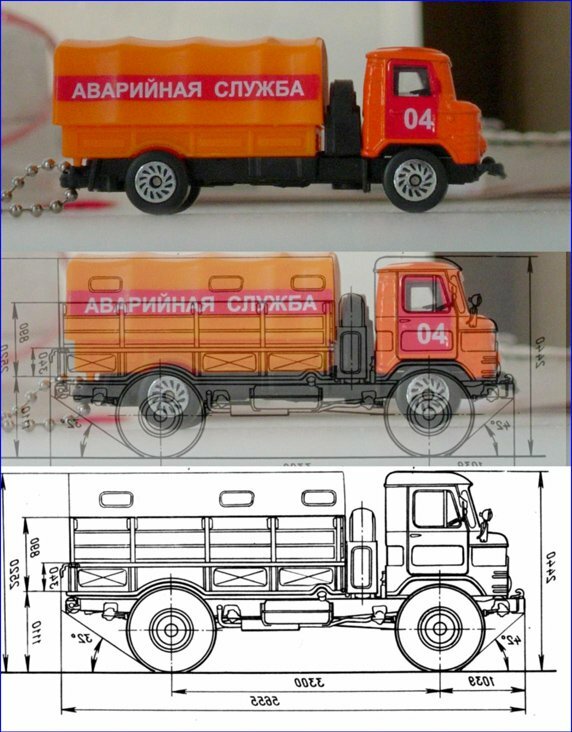 The attached photo montage shows which need improvement, for the conversion of keychain - into a fully fledged model. First of all, we must raise ground clearance and replace the wheels on the corresponding diameter. They can take, for example, from children's toys.